Forum Index > Historical Arms Talk > I'm stuck in my research about Rus and Russian armour. Posted: Wed 10 May, 2017 8:27 pm Post subject: I'm stuck in my research about Rus and Russian armour. Hello I'm new and this is my first time posting on a forum of any type in years so sorry if my structure or anything is not good. Now lets get to the point. I have been doing lots research on armour for about 2-3 years, I speak French as a first language and English as a second language and those languages have always been enough for me to get about any information I want on nearly any topic I ever researched until now. 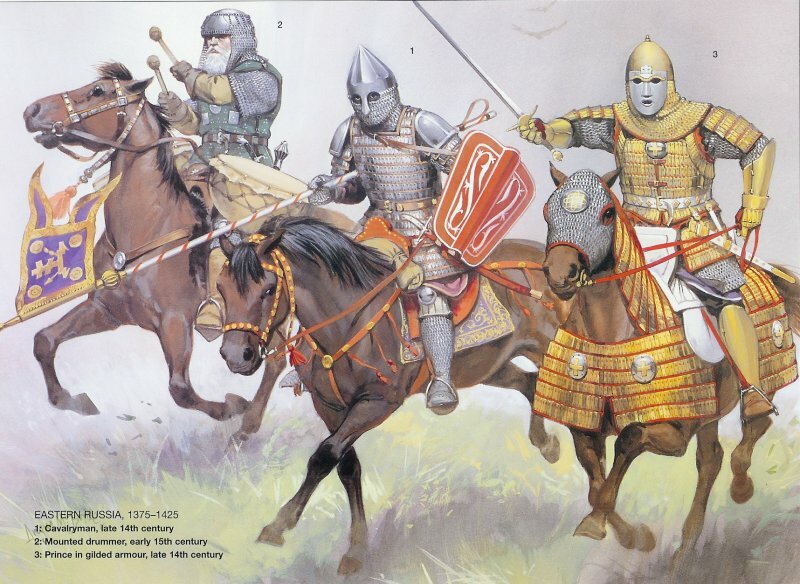 In the last few months, I have tried to focus on Ancient Rus and Russian armour, I tried to cover northern slavic style of armour from the 9th century to the begining of the second half of the 15th century and I have learned a lot, but it is not enough for me and now I'm stuck. Maybe I'm not doing my research the right way, but right now it really seems like I need to learn both Ukrainian and Russian to continue my research, since it seems like those slavs do not care for translating their research or the manuscripts to any other languages. I can't really blame them, translating old text is a pain in the ****, believe me I have done it with Middle French and some form of Ancient French (Oïl languages). I did find general information about nearly every type of armor the rus or later the russian used, I also did find a lot about their helmets style and shields, what I can't find is which style of body and sometime arms armor where used by wich kind of soldier (I know what was in use, I do not know by who) and I also can't find anything about the construction of russian style lamellar and scale armour, I can theorise that their lamellar was nearly identic to mongolian lamellar, but the lacing patern is never described. I also have the same kind of trouble with their scale armours, I have seen mentionned a few time that they made scale overlap in a different way than other civilisations and that it made their scale armours stiffer and harderto use an upward thrust to get through, but nothing describe the overlaping pattern. Scale armour was the reason I started researching rus and russian style, since everyone said it was unhistorical in Europe, but I had a book about wars with photos of it, so I got interested in finding if my book was a load of ****. Here is what troubble me the most, in nearly every articles, about rus or russian armour, scale armour is mentioned, sometime it is even specified to be something uniquely popular in Russia, but there is never any informations on where it came from, who used it (infantry, nobles, horsman), how it was constructed (riveted on a holding material or laced to it), if it was used with mail or with any kind of additional padding. Usually it is quite easy to find that kind of information about any other type of armor that come from an other region, but for the Rus that kind of informations always seems to be in Ukrainian or Russian and google translate is alredy bad when used to translate less complex informations, so for that kind of stuff it is not even close to be viable. I'm also aware that on most type of armor we lack some specific information, like if it was worn with a gambeson, but usually there is always some historians or recognised experts that give a theory on what was the most likely, but here it is lacking in both English and French. So I'm asking help, I would really apreciate if anyone could help me with finding the kind of information I can't get, especially about lamellar and scale since i want to make a late 13th century or early to mid 14th century russian set that is not mail with plate integrated into it (Bakhterets, Kol'chuga and cie). 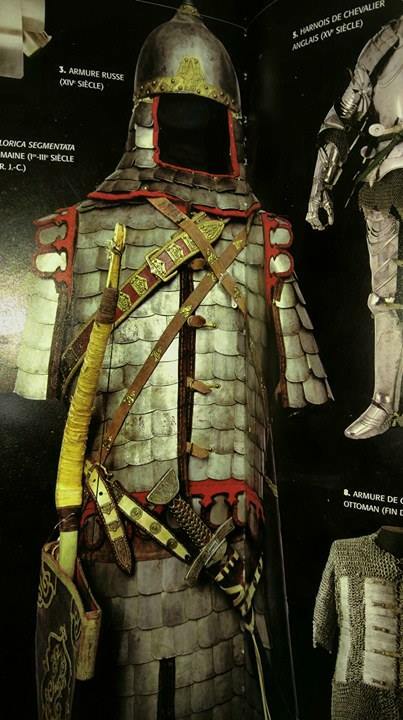 In fact I would make both a lamellar set and a scale set, since my researches led me to believe that russians of that periode prefered scale armour for infantry and lamellar for cavalry (I have no definitive proof and I will probably never have). Sorry if my English writting is not perfect, French is still my first language. When it comes to any kind of mail, helmets or lamellar I have a lot and I mean a lot of images like this, that often have informative text on them. I also have a lots of images like this one that come from some russian or ukrainian site and I have close to no idea of what was said in the articles they were. This is one of the rare clear images I have of russian style scale armor and the late viking sword that is with this 14th century armour trouble me, since at that time it was outdated for almost 200 years. Posted: Thu 11 May, 2017 8:21 am Post subject: Re: I'm stuck in my research about Rus and Russian armour. I did find general information about nearly every type of armor the rus or later the russian used, I also did find a lot about their helmets style and shields, what I can't find is which style of body and sometime arms armor where used by wich kind of soldier (I know what was in use, I do not know by who) and I also can't find anything about the construction of russian style lamellar and scale armour, I can theorise that their lamellar was nearly identic to mongolian lamellar, but the lacing patern is never described. Tha's a problem I also often find myself into. I'm not a specialist in russian armor, and clearly not one of the best members in myArmoury to recommend bibliography, but I notice you posted an Osprey's book plate. If you already have read it, I would also recommend (actually even more than Osprey) Ian Heath's book to Wargaming Research Group: Armies of Middle Ages vol. 2. 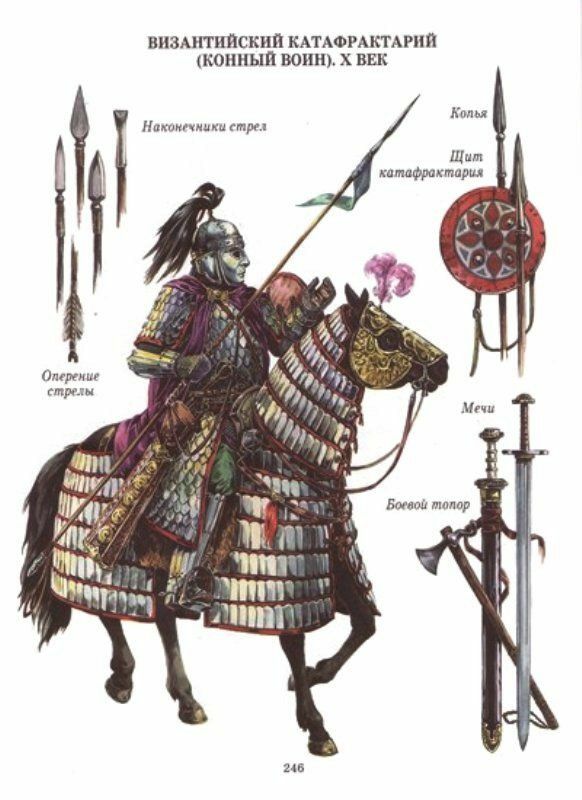 The book covers russian armor, both eastern and western principalities. I have the PDF archive in my computer, call me at inbox and I might hand over to you. About lamellar and even scale construction, it might be relevant to notice that Russian Principalities were influenced as much by the byzantines as it were by tartars/mongols and as by polish-lituanians. Dan Howard might disagree on that, since he defends that Thimothy Dawson made mistakes in his reasearch about byzantine klibanion (a new lamellar structure that appeared by 9-10th century), but - according to Dawson - byzantines developed a new model of lamellar that was considerably more effective than previous lamellar constructions. Since the Rus were under a heavy byzantine influence from their very beginning as Christian State, it sounds plausible to argue that their lamellar construction might be similar or even identical to byzantine ones. Also, you should be aware that are some differences between western principalities and eastern ones, due to the neighbour states' influence: Novgorod would be under heavier western influence than the Grand Duchy of Moscow, and so on; that means you actually find some popularity of "western panoply" in Western Principalities, like cuirasses and full arms and leggings plate pieces. In Armies of Middle Ages vol. 2, Heath quotes a primary source describing janissary equipment. The source talks about this exact helmet as one of the most popular janissary's helmets, stating that the plates were chained in the coif to "protect against sword slashes". I would guess this protection was popular in Eastern Europe as well, and was probably adopted by ottoman due to tartar and russian influence. Posted: Thu 27 Jul, 2017 3:25 pm Post subject: Re: I'm stuck in my research about Rus and Russian armour. Dawson's claims are completely fanciful. He has absolutely no evidence to support them. All he has done is to look at some pretty paintings and invent some constructions that look a little like some of them. I have already presented several alternative constructions that also look like those depictions. If there is no textual or archaeological evidence to support them, there there is no way to know which proposal has more validity. However all of my proposals are have precedent in the archaeological record. I'll repeat: there is absolutely no evidence for riveted lamellar being used anywhere in the world over the armour's two thousand year history. Posted: Fri 28 Jul, 2017 5:22 pm Post subject: Re: I'm stuck in my research about Rus and Russian armour. I'll repeat: there is absolutely no evidence for riveted lamellar being used anywhere in the world over the armour's two thousand year history. This is partly just definitional: if it's riveted, it isn't lamellar. Take for example Tibetan lamellar helmets. They're "lamellar" because the plates are laced together. Take the same plates, and rivet them (and we have examples of very similar plates in laced and riveted helmets), and it's no longer a lamellar helmet. Similarly, if you take lamellae and rivet them to a backing (of course, not to each other), you end up with scale or brigandine. The fastening method defines the armour. Helmets are of course different from body armour, and while it makes no sense to rivet body armour lamellar plates together, it does make sense to rivet helmet plates together. Russian lamellar http://terra-teutonica.ru/topic960.html Sorry, more russian to translate.